Heat a table spoon of oil in a pan. 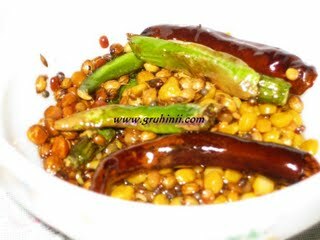 Fry 2 table spoons chana dal, 2 tea spoons urad dal,1 tea spoon dhaniya (whole) 1 tea spoon jeera and 1/2 tea spoon rai until they turn to golden color, Add green chillies and 2 red chillies and fry for few sec. and remove all the ingredients in to a bowl and let it cool. Now in the same pan add 1 table spoon of oil and fry finely chopped cabbage. 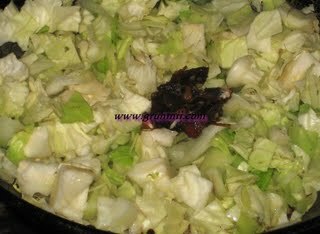 Add tamarind and salt to it, close the lid and cook in a low flame until the cabbage is done. Remove it into a bowl and let it cool. Grind all the ingredients coarsely in a mixer adding garlic pods and sugar (optional) to paste, add water only if necessary. Now heat a table spoon of oil in a pan. Add rai, 1 red chillies and curry leaves. When rai starts spluttering switch off the flame and add the thadka to the chutney and mix well. Cabbage chutney (cabbage pachadi) is ready........ This is an Andhra Style of Cabbage chutney which tastes good with rice, rotis and chapatis. 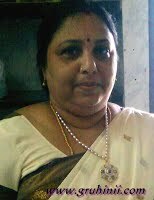 Try once.......... you will like it.